October 5 marks the World Teachers’ Day to honor the services of teachers whose efforts bear the greatest impact on the spirit and thoughts of future generations. In Iran, the situation is just the opposite. Teachers live under the poverty line and they do not receive any form of support. 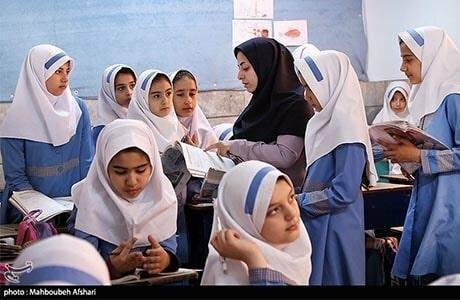 Women make up more than half of the teachers’ population in Iran. They live on salaries which are way below the poverty line and at the same time face numerous social and legal discriminations because of their gender. Despite tremendous work pressure, they do not receive a fair salary. Teachers officially and permanently employed by the Ministry of Education earn 1.4 million toumans per month ($140) while the poverty line stands at 5 million toumans ($500). This is less than one-third of what they need to subsist. The majority of teachers, however, work on temporary contracts. The monthly salary of contract teachers is between 300-450,000 toumans ($30-45) which is way below the minimum wage of 930,000 toumans ($93), which is itself less than one-fifth of the poverty line. They do not enjoy any benefits, either. Nevertheless, it frequently happens that teachers do not receive any salary for months. Contract teachers fill in for the shortage of teachers at schools. The Ministry of Education has for years prevented leakage of any information on the number of contract teachers and their gender. In light of the numerous legal obstacles women face in employment in Iran, given that the majority of Iranian women are engaged in jobs in the private and unofficial sectors, and by analyzing the combination of participants in the protests, it could be concluded that women comprise a large portion of contract teachers. With most teachers working two or three shifts a day to provide for the needs of their families, they are so preoccupied that obviously have not much energy to concentrate on the education of children. The Teachers Association has called for numerous nationwide protests over the past three years, to voice their demands and general needs of teachers. Most recently, the association launched a campaign where teachers tore up their pay slips. The teachers’ nationwide protest on May 10, 2017, held in 32 cities, was just an example of teachers’ widespread dismay at low salaries, difficult living conditions, lack of insurance and other job benefits, as well as the non-payment of past their due wages for consecutive months. In Tehran, the teachers’ protests met with security forces’ violence where teacher activists were arrested. Six of the teachers including Ms. Aliyeh Eghdam-Doost were arrested outside the Budget and Planning Organization’s building and subsequently condemned on September 15, 2018, to nine months of jail and 74 lashes for “disrupting public order through participation in illegal gatherings” and “defying on-duty officers.” This while the teachers’ protest was to demand increase of their salaries which are under the poverty line. Use of violence against peaceful gatherings of teachers was so disgraceful that it aroused criticism in the mullahs’ parliament and received widespread press coverage. Despite great risks and intimidations, women have always been at the forefront of teachers’ protests to demand and gain their rights.